A Review of "Arezu" CD in the San Diego Union Tribune by George Varga on Thursday, June 30, 2005, it can be read here. A Mahvash Azhir interview by Firoozeh Khatibi was done May 8th for radio FARDA, and it is available to listen to download in MP3 format here. 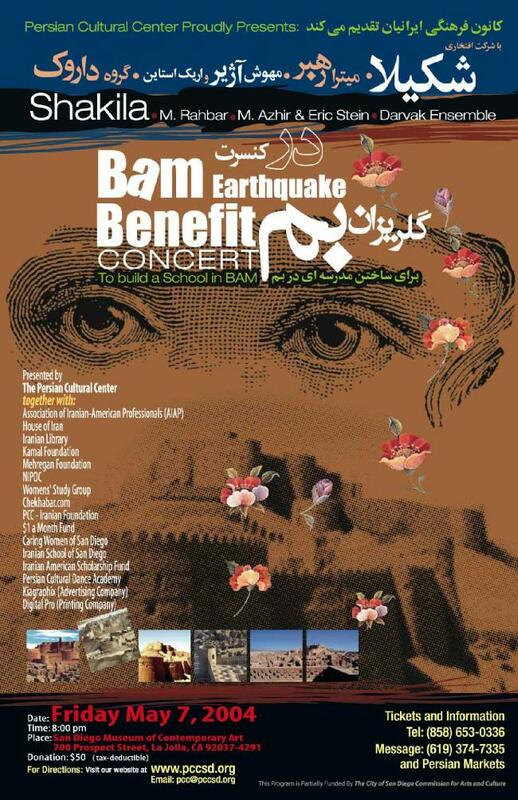 Mahvash Azhir & Eric Stein will be performing at the fundrasing event for the children of Bam in Los Angeles on Sunday April 18, 2004. 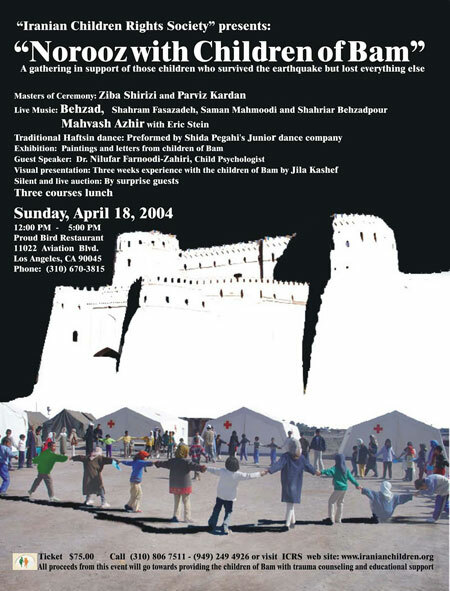 Click on the poster above to learn more about the Iranian Childrens society by entering their website. Click on the IPN logo above to enter their website. The Stein Brothers are Eric, Raphael, Edmund, and Rudolph. All began playing music before the age of five. Their parents, Erasmus and Valentina Stein, immigrated to the United States from the Ukraine in the 1950’s. Being involved in the arts, Erasmus and Valentina encouraged all their children, one daughter and six sons, to study music. The Stein Brothers have recorded and performed with everyone from Pavarotti to Elton John; from Yo Yo Ma to Celine Dion. For more information on artistic accomplishments, works in progress and contact information, please visit their website. Prince Hotel in Toronto, Canada. 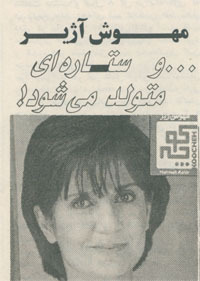 An article on Mahvash Azhir by Ali Sharifian published in Paivand, a biweekly newspaper for Persian Community in Canada. On June 28, 2002 there will be a replay of the MARCH 26th KPBS Interview. On Wednesday May 1st there will be a replay of the MARCH 26th KPBS Interview. 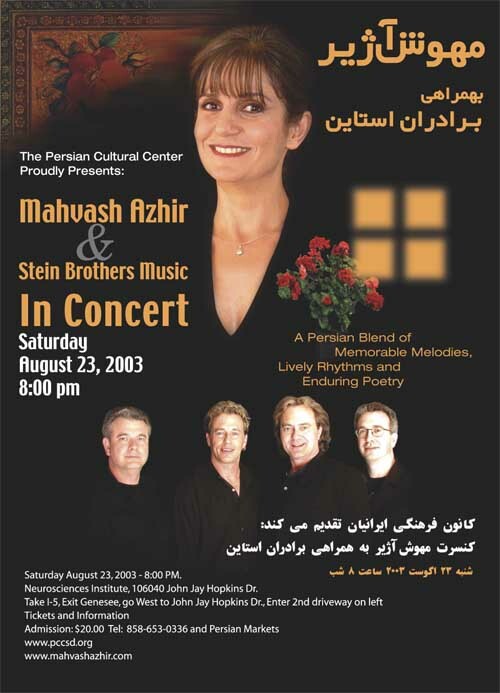 Mahvash Azhir and Eric Stein will be performing at The Iranian Women's Conference in Denver, Colorado on Sat. June 15, 2002. Mahvash Azhir was interviewed by hosts Sasan Kamali, and Azita Shirazi on KIRN 670AM, in the morning program :Thursday, March 5 at 9:00am. Mahvash Azhir & Eric Stein interview on KPBS 89.5 FM "The Lounge" scheduled for Tue. March 26 at 6:30pm. Selections from Mahvash Azhir's CD "Koocheh" to be featured on Kenny Weissberg's radio program "Music Without Boundaries"
Union Tribue Notes Mahvash Azhir in Concert with Stien Brothers.